2759 Audrey Lane- Huge Family Home!! 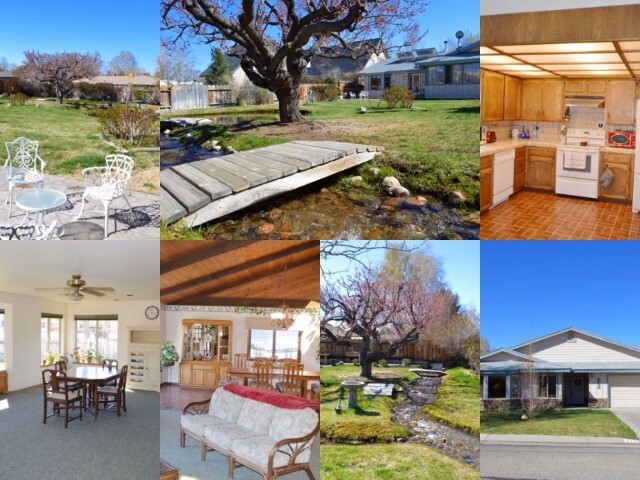 2759 Audrey Lane, Bishop California is located in a quiet neighborhood with wide streets, shaded by mature trees and close access to walking paths and motorcycle trails. This large family home of 3,091 square feet offers 3 bedrooms, 2.5 bathrooms, living room, hot tub room and art studio. The open floor plans offers vaulted open beam ceilings, with skylights in the family room/ dining area. The family room offers glass doors that over look the deck and backyard. The home also offers a 2 car attached garage. The fully landscaped from and back yards offer easy maintenance. The backyard offers a meandering creek and pond with sitting areas to enjoy the ambiance, making your own paradise. Raised garden areas perfect for growing veggies or adding color with your favorite flowers. A storage shed offers additional storage for work and garden tools.